Householding is the process of grouping clients that share common interest as it pertains to the bank's business. This grouping can come in multiple forms such as families or multiple businesses owned by a single entity. This article explores how householding is captured in PrecisionLender with a focus on institutions that send householding data along with the standard relationship awareness upload. Primary Relationship - The 'smallest' representation of a person or business. The unique key is known as the "relationship external identifier" which is usually a hashed social security number or hashed tax Id. Relationship Family - The high level relationship. Families contain one or more primary relationships and can be assigned an optional "household Id". Household Id is a unique identifier (usually not PII) that is hashed by PrecisionLender. Householding - The act of grouping primary relationships together into a relationship family. Here is a visual representation of what a household looks like in PrecisionLender. Accounts belong to primary relationships and primary relationships belong to relationship families. Every primary relationship has a family, even if it is not involved in householding. Here is an example of what happens when "Erin" (primary relationship) is merged into "Colin" (relationship family). Erin, the relationship family, is deleted while the primary relationship is now linked to Colin. 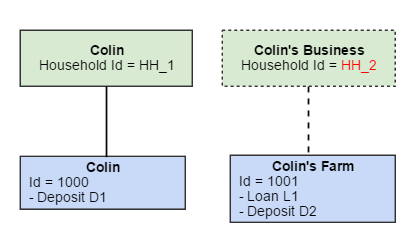 If the core system were to split out "Colin's Farm" into a new family called "Colin's Business" it would need to specify a new household Id and name. PrecisionLender would read this and create a new family as shown here. Can relationships change households in PrecisionLender? Yes - It's as simple as changing the household identifier for the relationship family in the data upload. Who controls the household structure - the Lenders or the Core System? This is assuming your organization's process allows lenders to control relationships and they have the correct permissions in the application. Core system will not split out or rename a relationship that the lender merged. Undoing a lender's merge just causes confusion and more work for the lender. Core system can split out or rename relationships that were not modified by a lender. Core system can merge relationships. Merging relationships is usually a safe operation that will not negatively impact the lender (unless the merge involves splitting a relationship that the lender created). Overall, PrecisionLender keeps track of the relationship changes and knows when a lender manually changes the relationship. As long as a lender does not modify the relationship the core system will maintain control. Additionally, the core system will re-assume control of a relationship (for future splits and merges) if a lender updates the relationship to exactly match the core. My relationship family structure in PrecisionLender doesn't match my Core System. Why? Primary relationship specifies two different households. Uploaded data files might have multiple records (accounts) specifying the same primary relationship. Make sure all references have the correct household information. The household name differs between two entries (The household is shared in multiple places but the names don't match). Core tried to split a lender managed relationship. Check the Data Feeds "Relationship Splits" report and see if there are any 'ignored' entries. These will have to updated manually in either PrecisionLender or the core system. There are two items to check around this type of error. Relationship in PrecisionLender has more primary relationships than in the core system. Relationship in PrecisionLender has a different name than in the core system.